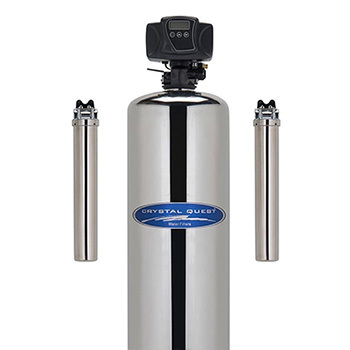 Whole House Arsenic Removal System by Crystal Quest is a 3 stage filtration unit specialized for removing Arsenic from your drinking water. 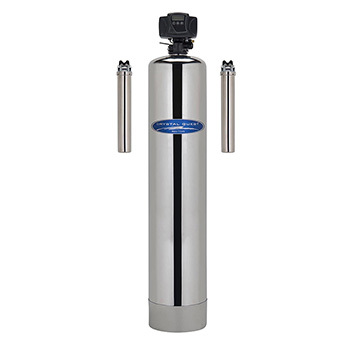 Filtration process is distributed into 2 20" x 2.5" cartridge housings(Sediment and Solid Carbon filters) and 1 Poly Glass mineral tank filled with Arsenic removal resin - CQA. The resin effectively removes Arsenic III and V(Arsenate and Arsenite) and is also capable of completely removing or reducing arsenic below 10 ppb from as high as 50 ppb (10 ppb is an EPA Maximum allowed level). 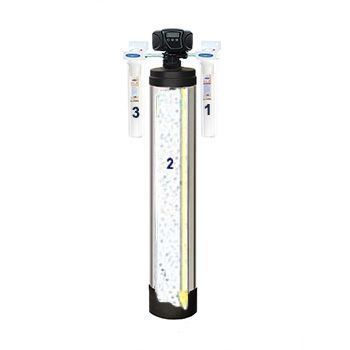 Its the most advanced and effective Arsenic Water Filter on the market today. Arsenic(As) in water has no color, taste or odor and is not easily dissolved. It is a semi-metal element that occurs naturally in the environment, as a by-product of mining, or agricultural areas when materials containing arsenic are used as industrial poisons. It enters drinking water supplies from natural deposits in the earth or from agricultural and industrial practices. Arsenic is highly toxic and has been classified by the US EPA as a carcinogen, which was derived from toxicity considerations rather than carcinogenicity. If Arsenic is in your water, specialty Arsenic removal system such as the CQE-WH-01147/CQE-WH-01148 and proper contact time can remove this contaminant. 3 stages of filtration designed for Arsenic removal. 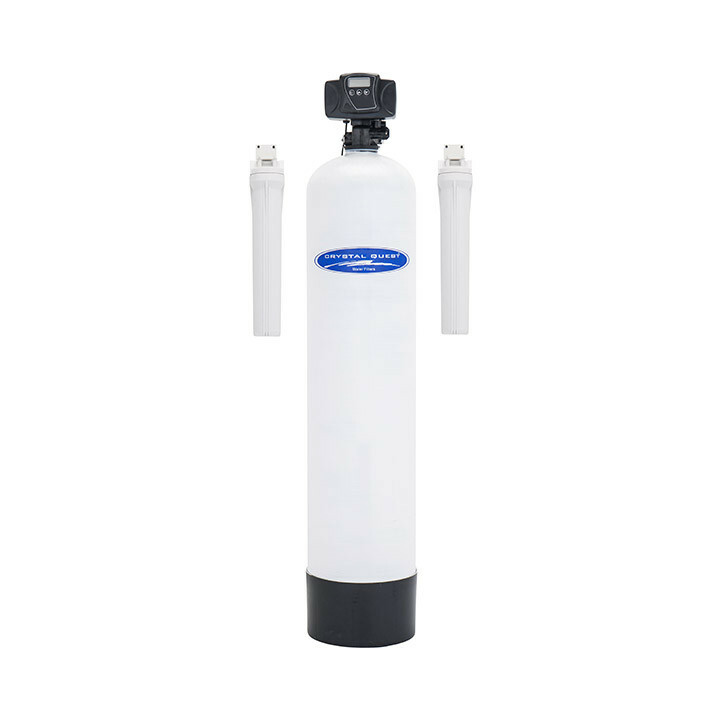 Engineered for maximum filtration and maximum performance with minimum maintenance. Solid state microprocessor with LED display Electronics Control Valve. Easy to replace resin media. * Automatically removes the trapped contaminants within the filter bed and washes them down the drain. 1" IN/OUT , inquire about 3/4" (or mention in a note during checkout). (!) Arsenic Removal System has been tested to take Arsenic from 50 ppb to below 10 ppb, and sometimes to undetectable (depending on water flow, slower is better). If your Arsenic level is higher than 100 ppb, consider installing two tanks in parallel, or a Commercial Arsenic Removal Water Filter System. If arsenic is only a fractionally higher than EPA limit, such as 11-15 ppb, the media will last longer. Q. Why does this filter need a backwash, when other arsenic filters claim they do not? A.It is normal for the filtration media to get compacted and to develop "channels" during operation. Once media compacts, and water develops channels where it flows without significant contact with the media, performance of the unit deteriorates, sometimes significantly. Backwash is a good way to refresh the media to prevent compacting and channeling. It keeps media at the top performance, and increases the life of the unit. Q. I found a system that is cheaper and also removes fluoride! A.Our system can remove both arsenic III and V. There are products out there that use fluoride removal media, which is less expensive, for arsenic removal. In fact, the main purpose of such systems is fluoride removal, and some arsenic reduction is incidental. 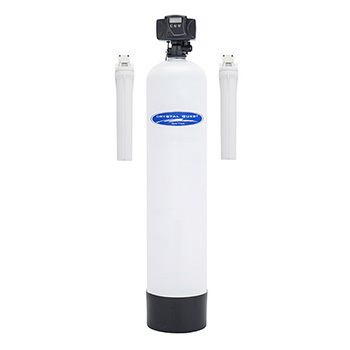 If arsenic in your water is close to EPA standard and you are comfortable with partial arsenic reduction, you can try our Whole House Fluoride Removal Filter, which is slightly less expensive and also reduces arsenic. Keep in mind that those cheaper systems are limited to specific types of arsenic and will not remove both types III and V like ours. - Use on cold water line only! - Ships complete and ready to be plumbed in. 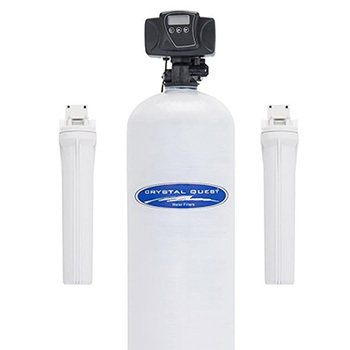 - 10 year Warranty on Poly resin tank. - 10 year on Stainless Steel resin tank. 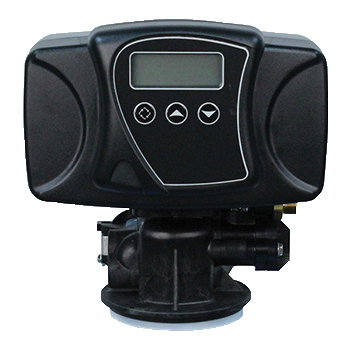 - 5 year warranty on Electronic backwash control valves.